Angela O’Donnell has reviewed poetry and fiction in these pages and was a finalist for America’s Foley Prize in poetry. After two poetry chapbooks, this is her first full-length book of verse. Moving House is a deeply affecting book. It balances hard truths with a sweetness of spirit that is, if not singular, rare in our time, especially in contemporary poetry. O’Donnell’s book begins in recollection of her childhood home in Pennsylvania mining territory, a place so grim and dark and claustrophobic that in her first poem she links it to the ancient tragedy-ridden House of Atreus and Edgar Allan Poe’s story “The Fall of the House of Usher.” In “Touring the Mine,” we learn about “the tight-lipped men/ our fathers” who “split rock in the dark,” the author’s father among them. In “Looking Back” she writes touchingly, “we fled again—…refusing to be buried in that place/ as you, in your quiet grace, did not.” The soft off-center rhyme of “place” with “grace” is a mark of O’Donnell’s careful craft. Grouping poems in seven sections, she leads us from this unspeakable (those men are tight-lipped) devastation and a poem, ironic and powerful, about “the crucified before Christ” (“The First Art”) through poetic songs celebrating saints of the church and the saintliness of artists and the homelier saintliness of family, friends, neighbors and community to a less constricted realm in which possibility and autonomy play a salvific role. The book’s journey is indeed, as the title suggests, one of “moving house” from a dark to a brighter place—though one might also read the title as an epithet for the world, which is, of course, a moving house. that said you, you, you are the one. We take our saints, then, where we find them, hoping perhaps to find ourselves in them or, rather, embraced by them. At the same time, the poet’s light self-mockery in “My Bonanza” renders her accessible, all the more human in her quest for emotional and spiritual freedom. O’Donnell sometimes literally sings her poems at readings: that strikes me as both suitable (to the poems) and fetching (for the audience weary of rhetoric). and, once, were felled by fire. But this is bravado, for the speaker sees that “my own moon face/ greets me ghostly in the glass” of the train window. She is still herself, plunging into a new environment but aware of real limitations. And in “Reading in the New House” she recognizes in a book about elephants the sisterly consciousness that crosses species to express a love of home, as if she were both elephant and free woman. As we do when we move houses, she both anticipates and laments. In a brave poem in the last group, O’Donnell returns to the burning towers of the terrorist attacks of Sept. 11, 2001, finding in that holocaust an image of “stigmata,” arguing that God loves even “this world/ of fireball and ash.” Yet these final poems, because they take in new breath, new lives, are buoyed by compassion to supply that splendid balance I mentioned above. Snowflakes in a snowfall are transfigured to “Flecks of light from heaven./ Splinters of struck stars” (italics hers). In such snow and wind, “What mercy for the birds?” she asks. It is a profoundly distressing question, but readers will recognize that the poet who asks that question already feels within her a necessary mercy and will respond in kind. Associate Director of the Curran Center for American Catholic Studies at Fordham University where she teaches English, Creative Writing and American Catholic Studies, O’Donnell has been willing, through her reviews and critical writings, to wrestle with the hydra-headed monster, “What is Catholic Poetry?” and describe at least a head or two. Now she has published her own first full-length poetry collection, Moving House. To my relief, she left both critical theory and religious dogma at the door. Moving House ranges through a heady mix of topics against an autobiographical backdrop, the bleak days of O’Donnell’s childhood through the quiet chronology of a move in her maturity. The first sections contain poems of her Pennsylvania coal-town upbringing, the death of her father, her mother’s edgy widowhood, an arsonist cousin, her grandparents’ graves, gardens and warped floorboards. There is no excess sentiment, no confessional tugs to these poems—merely the most telling details to render the larger story. A mother ostracized for her propensity to take on lovers and a weekly venue for this censure to occur might reasonably be expected to trigger anger against the individuals and institutions involved, but there are no traces of anger or references to the process of forgiveness and reconciliation. It just is. Many of these autobiographical poems appeared in O’Donnell’s chapbook, Mine. What gives them new life and even added depth in this collection is their placement alongside poems from her other chapbook, Waiting for Ecstasy, a collection of poems religious in tone and subject matter. The inclusion of such disparate material, arranged so that a poem about Maria Goretti and other girl martyrs coexists with a poem about making an apple pie, struck me as thematic, a bit of O’Donnell’s Incarnational awareness, invisible unity at work. poet among the dead and dumb. St. Agatha’s breasts, sliced and served. St. Lucy’s mild eyes upon the dish. And St. Cecilia succumbed, they say, singing. shaft dug beneath the house long before. and she takes us to grave sites, her father’s, grandmother’s, Hopkins’ as mentioned, but also Melville’s (St. Melville) and the great unknowns, All Souls and All Saints. slid in the crevice beside them. beneath the soft weight of white? seed of sky and worm of earth? comes a cold, slow sleep. Time’s winged chariot rides again. Finally, to return to my original questions. O’Donnell willingly embraces for herself the rubric “Catholic poet.” Many of these poems do draw on Catholic imagery and what could even be called Catholic superstition, but I would describe the poems as much catholic as they are Catholic. After all, orthodoxy has not yet caught up with St. Melville. However, and this is more to the point, the quality of her imagination and the willingness to live in a porous world is Catholic, as she defines it. Her refusal to dichotomize between heaven and earth, the sacred and the profane, as I understand the arrangement of the poems, is the most compelling argument for an incarnate faith. I am left with only one question, perhaps of my own making. “Lies,” the first poem of the book, ends “We lived and died by stories in that house.” I know they are stories, but in what sense, I read the book wondering, are they lies? Other than its placement as the first poem of the collection, there is nothing else in the text to justify reading this as a post-modern undercutting of all that follows. Still to have the first poem of a collection signal “Lies” does pique my interest. My own definition of Catholic poetry, not limited to Catholic poetry either, assumes an individual wrestling, albeit at the intersection of heaven and earth, with the question of what is a lie and what is not, what is the truth. Perhaps O’Donnell’s answer would be that nothing is a lie that points you in the right direction. Or perhaps this is a question I, not the text, am asking. In this, her first full-length collection, Angela O’Donnell explores the theme of “home,” not in a cozy, Hallmark-y way, but in delineations as sharply etched and striking as the cover art, “Inferno on Dumbwater Creek.” (Margie Crisp, 2002) There is the home of childhood, built on the bones of the past, and the seams of coal her Italian immigrant forbears mined. There is the home of the Catholic church, both the church of the present, and the historical one. There are the literal homes of her adult life, the house in Baltimore, and the one in a New York City suburb. There’s the house that Poetry built, where she nails up tributes to her heroes in both poetry and prose: Shakespeare, Dante, Melville, Thoreau, Sexton, Hopkins. And the House of Art, where Manet, Wyeth, Vermeer, and Munch decorate the walls. Her sense of the past is deep as bedrock, as is her sense of faith, a rare thing in this post-modern age. Some of the other ways she embodies these themes is through her elegiac tone and her finely crafted language, which seems to be mined from the core of the earth. For example, in writing about the coal town where she grew up, she describes slag heaps where “culm dumps rise camel-backed /against an ashen sky,” and the breaker looms with its “black apertures.” (“Breaker”). Here, there are “coal-black nights,” where “the furnace coughed deep in the cellar” and “our father rose in the iron cold.” (“Northern Nights”) O’Donnell has a keen ear for gritty sound: “the chunk / and swing of the metal door unhinged, / the steady thrust of the rusty shovel / graveling against the binful of coal.” (“Northern Nights”) And then she hears something softer: “the sluff of slippers, “ mother’s voice “calling us to hot milk at midnight,” // to slip on coats and scarves and hats and gloves.”(“Northern Nights) The l’s and s’s lull us to sleep, too. O’Donnell’s poems sing with the pleasures of language. She has taken up her pick, put on her miner’s helmet, and has descended into the shaft of the past, finding these gems of poems, and bringing them to the light, where they shine and shine. A subtitle for this collection of expertly crafted verse might be “A Memoir in Poetry.” Angela Alaimo O’Donnell has arranged the poems so that they loosely follow the chronology of her life. First come the dark memories of a grimly loveless childhood in the coal-mining region of Scranton, Pennsylvania. Her father was a miner, and in “Late Elegy” she says to him, “No poems for you, my father. / I was always too afraid. Your quick anger, your dark days.” After her father’s death, her mother brought home a series of overnight lovers, ignoring the children’s craving for “peanuts, chips, mints, / small signs she’d remembered us” (in “Other Mothers”). The poem “Grandmother’s Living Room” gives a powerful sense of O’Donnell’s childhood, lived literally and figuratively atop open mine shafts that might at any moment collapse. Though death remains a present reality throughout Moving House, as the poems move into moments of O’Donnell’s adulthood much of the darkness dissolves, and she offers images of a brighter, fulfilled family life. The poems about her sons are particularly touching given O’Donnell’s own painful childhood. We share her grateful joy at simply watching her sons play baseball outside the window (in “Staking Claim”). The poem asks “Can I wish me a blessing?” and we eagerly assent. In “Waking the Children,” she is beckoned by her sons’ idyllic sleep-world to “wade deep into their sepia waters.” Here is another borderland, but one that doesn’t require loss in the crossing over. I’ve noted that the poems of Moving House follow a loose chronology of the poet’s life. But there is more to their arrangement than this. One of the arts that must bring great delight to a poet compiling a volume of her verse is the art of ordering the poems. O’Donnell is a master of this art. She juxtaposes poems so that they pick up each other’s images and motifs. It is as if the poems themselves are placed in conversation, with the space between them inviting the reader into another dimension of reflectiveness. And so the whole of Moving House is definitely more than the sum of its individual parts, as insightfully crafted as each part – each poem – already is. 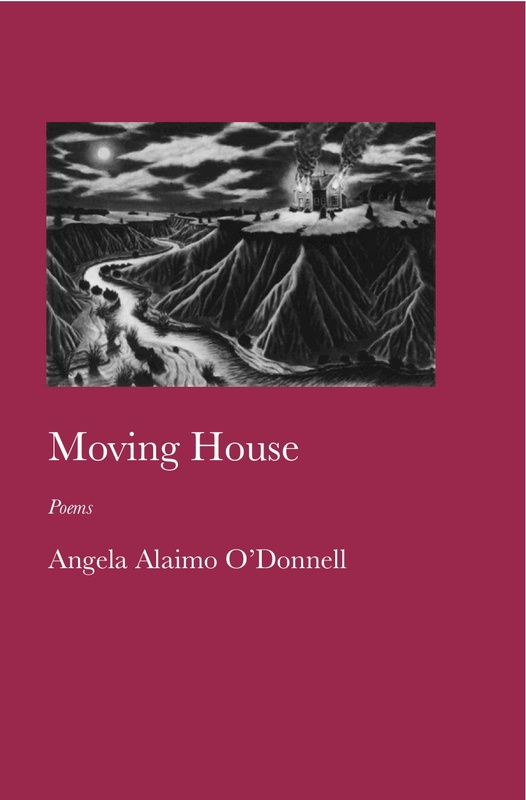 Moving House is Angela Alaimo O’Donnell’s first-full length book, though many of the 49 poems here appeared in her earlier chapbooks Mine (2007) and Waiting for Ecstasy (2009). Like the titles of these, Moving House resonates with a multitude of meanings residing inside the word house–corporality, physical dwelling, family heritage, psychic geography, poetic text, literary kinship, burial plot, and heavenly home. Though written for the most part in taut, compressed lines, her poems read more like conversation between the poet and her earlier selves or between O’Donnell and her audience invited to share the intimacy of memory conferring meaning, whether in a domestic space or a shrine. 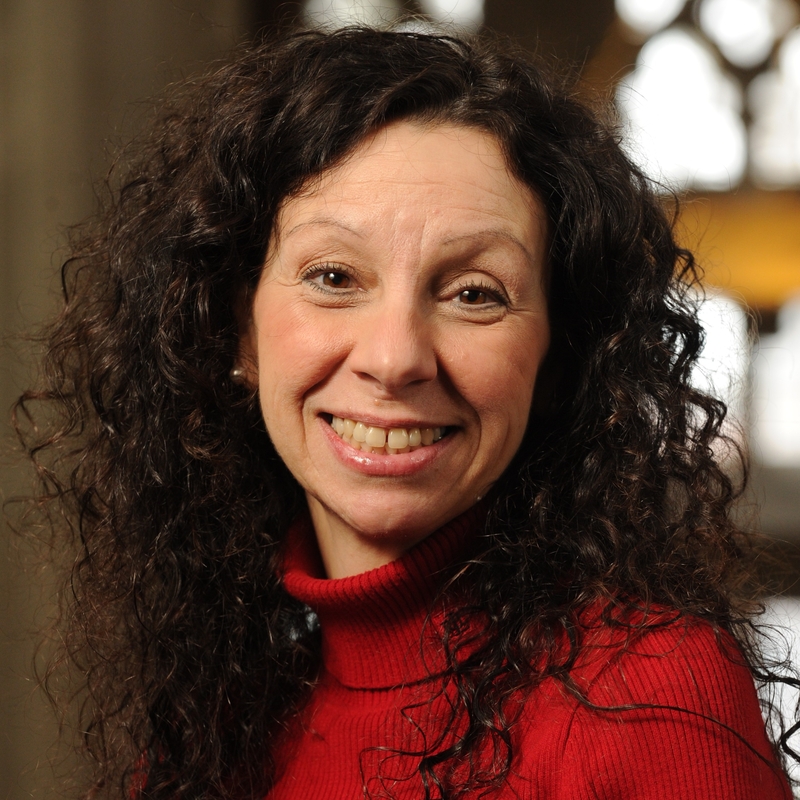 Divided into seven untitled sections, Moving House charts her spiritual journey from the coal mining region around Wilkes-Barre and Scranton to Baltimore and finally to Fordham where she is the Associate Director of the Curran Center for American Catholic Studies. On her journey we tour the various houses in which O’Donnell links the eternal to the temporal, the mystery of the incarnation. Rooted in a theology of loss and gain, her poems physicalize the spiritual but also spiritualize the physical. Deftly weaving the metaphors of scripture into poems about the quotidian world of the flesh, O’Donnell brings us closer to the divine. In “Grandma’s Pears,’ for instance, she describes the old woman paring and eating the “Sweet, sinewy fruit” from her garden: “She places a wafer upon her tongue, / works it with her gums, / and swallows softly / this new world’s body, / her yard full of pearls of great price” Here is an example of the “language of eternity and once” (“Tattoo”). Structurally appropriate, too, the first poem in Moving House is titled “Lies” while the last is “New Year’s Eve Poem”; between cruel illusions (a consequence of living in a postlapsarian world) and the birth of a new year (resurrection) lie the epiphanies O’Donnell discovers and discloses. As the above, and many other examples demonstrate, O’Donnell’s poems are the product of wit as well as wisdom. In “Druscilla’s Dance,” Salome’s sinfully venal sister’s “painted toes strapped into her sandal met the magma first.” In “Glitter makes everything better [sic],” she likens the temptation in Genesis to a woman entranced by the devil’s bling. “Prometheus discovered fire / Eve discovered glitter / Bright baubles on the tree / the diamond in the serpent’s eye” In a less pungent vein, O’Donnell shares an easy friendship with Dante as she prepares dinner (“Dante in the Kitchen”). As she busies herself with teapots, Coca Cola cans, frozen meat, lighting a broiler, and adjusting her apron, O’Donnell injects gory vignettes from The Inferno–e.g., “Simoniacs … boiling in pitch” or “Ugolino graws on the head of Ruggieri”–and concludes: “Our worlds do not mesh / Mine and Dante’s / Anywhere better than here.” Two decades earlier, playwright Adrienne Kennedy wrote about a similar literary friendship in She Talks to Beethoven. But what makes O’Donnell’s Moving House so surprisingly cohesive is that her style accommodates a variety of genres, or variations of a genre, be they eulogies, lyrics, meditations, or satires. No less to her credit, Moving House proves that O’Donnell is a poet of careful pitch as well as sense. Her poems cry to be read aloud as she orchestrates them with alliteration and assonance. When her father tries to fix a rebellious furnace, “We’d hear the turn of the handle, the chunk / and swing of the metal door unhinged.” As the “Blues Man” boyfriend drinks Scotch, the “ice would swish and ring / against the glasses,” Hearing her sons play baseball, O’Donnell captures the sound of leather against leather in these lines: “the slap of the ball / in the glove’s deep pocket” Standing on “cliffs / above the boulder-smashing sea” in “Inis Mor,” O’Donnell discovers “Words flung against the wind / the wind flung back” another image that verbally and visually evokes the spiritual and the physical forces at work in her poems. There are many rooms in O’Donnell’s Moving House, and I congratulate her on taking us on a virtual tour of their soundly constructed architecture.